The OneDetection-kit is intended for the self development of a rapid lateral flow test. The OneDetection Kit contains components designed to easily develop custom lateral flow devices. As the OneDetection strip is generic, the use of two analyte specific antibodies: a biotinylated capture antibody and a gold colloid conjugated detection antibody that are mixed in an optimized concentration – allows both qualitative and semi-quantitative measure with the OneDetection strip. 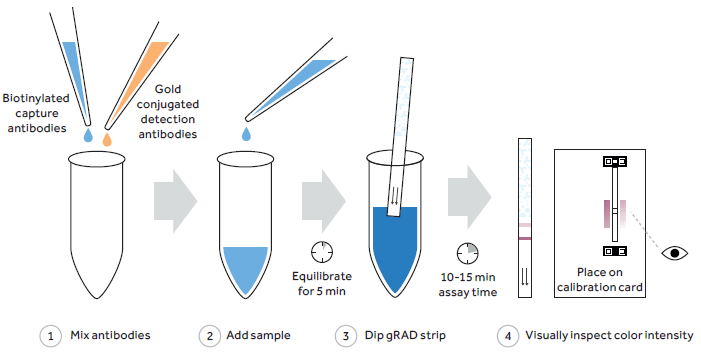 The Naked Gold Conjugation Kit allow optimized conjugation of gold colloid to the chosen detection antibody and the Sample Dilution Buffer is used to apply the specimen to the oneDetection strip. Use of the supplied calibration card allows both qualitative and semi-quantitative measure with the OneDetection strip. It is recommended to perform more than one optimization round.